As a youngster growing up on the hill — well, in my case halfway up the hill — I was the youngest of the group. 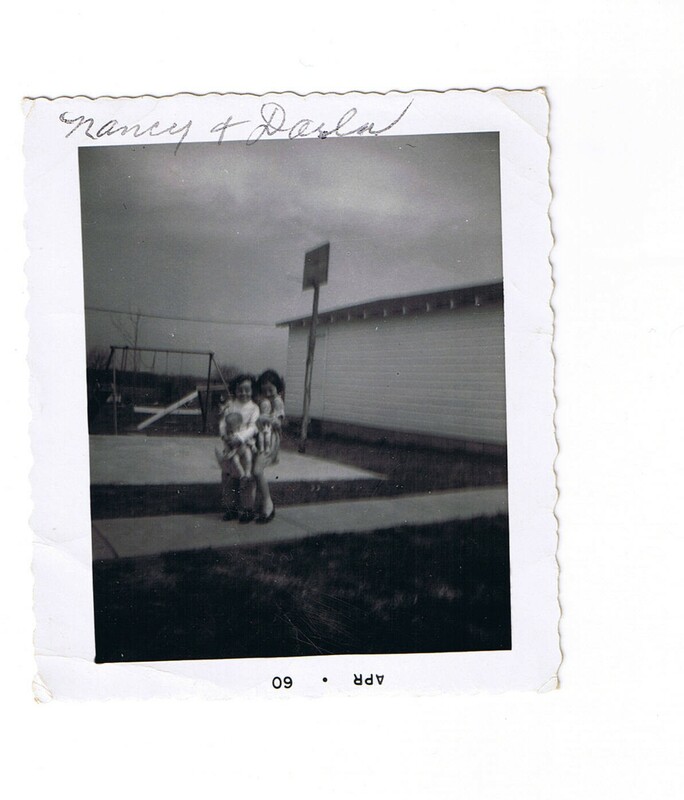 Of course, I’m not counting the non-people: my little sister and her friend, Nancy. At the time I thought they were ridiculous: everywhere they went carrying their baby dolls with their diaper bags thrown over their shoulders; spending hours on end playing with Barbie dolls; pretending to be the Beatles. Actually, that’s one of my best memories now. One of them would stand on the bed and sing and play the guitar, eyes closed, head shaking. The other one would stand at the end of the bed screaming like a fool, grabbing their hair, then eventually passing out in the floor. I used to stand in the hallway and watch them. I was, of course, so superior to those goofballs. On the other hand, my friends were cool and exotic. They rode horses and had goats . Well, Gail had goats. This picture was taken back in 1960 when our little town was having a celebration for our sesquicentennial year. There were parades and all sorts of activities. Gail and her goat won first place. 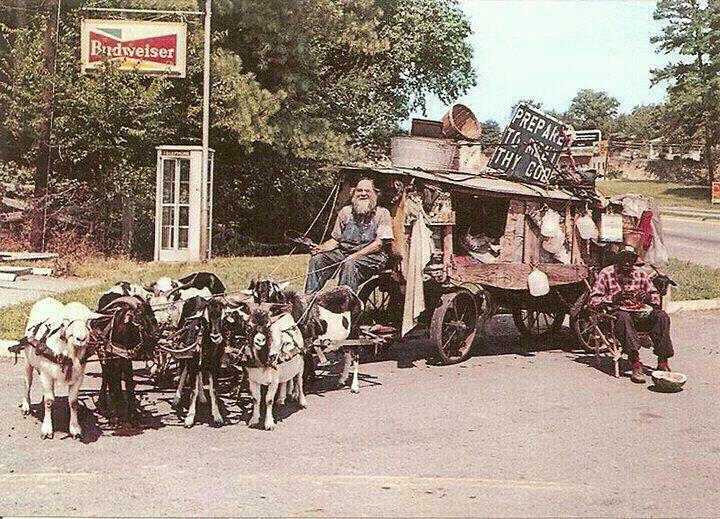 Her love of goats began with the Goat Man who came to town about once a year back then. Today he can be found on the internet. I googled “goat man” and got all sorts of interesting information. I’m hoping Gail doesn’t decide to get herself a passel of goats in her later years. Oh my goodness!! How funny😁. There were several of us reliving the Beatles when their special came out a few weeks back. I don’t think Nancy and I will ever forget all the pretending we did. We both had big imaginations. In that picture I look like a hard-working mama and she looks like a Hollywood mama all posed for the picture. And the Goatman!!! Never knew this man existed. 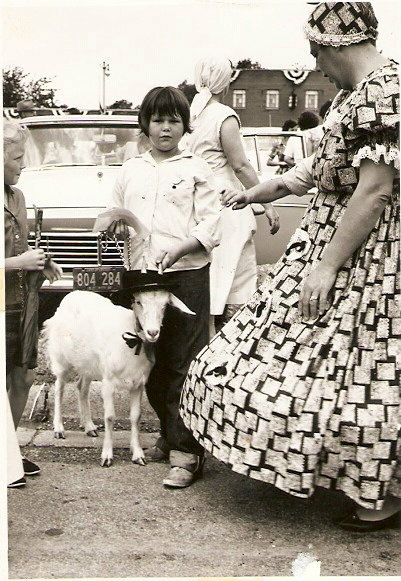 Oh yes, I loved my goats! My first goat, Blondie, would follow me everywhere. That is Frosty in the picture. I had five goats. Little twin babies Dawn and Dusk , named so because one was blonde and one was black. Goats make wonderful pets!! you were only non-people back when I couldn’t stand Darla. hahaha Of course, she’s my best friend now. So I guess that puts you two up into the real-people status. This is one of the best things you have ever posted. I laughed and laughed.